The PACTS online learning package comprises six modules, each taking a maximum of one hour to complete. The following summary outlines the contents of each of the six modules. Module 1: Defining ‘Family Violence' - provides an overview of background knowledge and information about the issue of family violence within our community. It also outlines the extent and prevalence of family violence in Australia, its associations with health and wellbeing, plus the economic and social impacts. 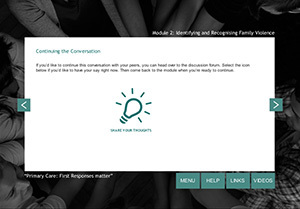 Module 2: Identifying and recognising family violence - encourages students to think about their own attitudes toward family violence, consider how the issue of family violence may affect their future practice, and reflect on patient or client experiences of family violence. It also outlines possible indicators of family violence, groups at particular risk of family violence, and the particular times a person can be at increased risk of family violence. Module 3: Assessing and responding to risk - introduces students to some different ways in which they can respond to patients or clients once they have identified possible indicators of family violence. 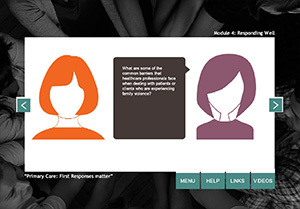 It encourages students to think about the kinds of questions they may ask clients or patients about their health, and about the possibility of experiencing family violence, and finishes with looking at the processes involved in undertaking a basic risk assessment. Module 4: Responding well - outlines how healthcare professionals can appropriately respond to patients or clients who are victims, or perpetrators, of family violence. It describes the barriers professionals may encounter as well as the expectations, needs and interests of people who do disclose. Learners will also explore the concept of trauma informed care. Module 5: Management and referral pathways - encourages students to reflect on the importance of being part of team in managing and responding to family violence, and highlights key medical, legal and community referral pathways. In addition, the role health care professional's play in engaging with communities to advocate for the prevention and intervention of family violence is discussed. Module 6: Safety, reflection and self-care - discusses the strategies health care professionals can employ to ensure their own safety and wellbeing when working with victims or perpetrators of family violence. If you wish to receive the six PACTS modules as SCORM packages for uploading onto a Learning Management System (LMS) please contact Associate Professor Jan Coles – email: jan.coles@monash.edu . (Note: SCORM (Sharable Content Object Reference Model) packages are generic files that can be uploaded onto any LMS). Also contact Associate Professor Coles for any other enquiries concerning alternative delivery modes for the PACTS resources. 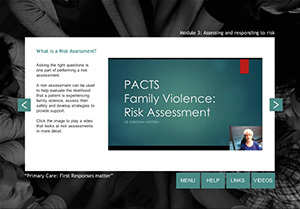 Videos, develop for the PACTS package, depicting acted survivor stories, professional champions accounts, and portrayals of best practice encounters.